The U.S. is a country of 50 states covering a vast swath of North America, with Alaska in the extreme Northwest and Hawaii extending the nation’s presence into the Pacific Ocean. Here are 100 reasons to visit USA. Arizona’s Grand Canyon is a natural formation distinguished by its layered bands of red rock and its vast scale, averaging 10 miles across and a mile deep along its 277-mile length. Much of the area is a national park. U.S. Route 66, also known as the Will Rogers Highway and colloquially known as the Main Street of America or the Mother Road, was one of the original highways within the U.S. Highway System. America is big, very big. Pick a direction, any direction and just take off and see what happens. Small towns, beautiful scenery and a multitude of delicious things to eat will all be your reward. Americans are Extremely Friendly and Interested in Travelers. They thank people for service well done. Mendenhall Valley is an area of Juneau in the U.S. state of Alaska. The valley, named for physicist and meteorologist Thomas Corwin Mendenhall, was formed by Mendenhall Glacier over the course of roughly three thousand years. Yellowstone National Park is a nearly 3,500-sq.-mile wilderness recreation area atop a volcanic hot spot. Mostly in Wyoming, the park spreads into parts of Montana and Idaho too. Yellowstone features dramatic canyons, alpine rivers, lush forests, hot springs and gushing geysers, including its most famous, Old Faithful. Despite being the new kid on the block, the United States is full of historical attractions in every corner of our country. Who can forget Lady Liberty, who welcomed so many hopeful immigrants to her shores? Or the Alamo, where a turning point was made in the Texas Revolution? Yosemite National Park is set within California’s Sierra Nevada mountains. It’s famed for its giant, ancient sequoias, and for Tunnel View, the iconic vista of towering Bridalveil Fall and the granite cliffs of El Capitan and Half Dome. America is a melting pot, and with that comes a kaleidoscope of options in the culinary department. Chinese food in San Francisco, Mexican in Arizona, Indian in New York City, and of course Southern home cooking in the South. The Statue of Liberty is a colossal neoclassical sculpture on Liberty Island in New York Harbor in New York City. Canyon de Chelly National Monument was established on April 1, 1931 as a unit of the National Park Service. It is located in northeastern Arizona within the boundaries of the Navajo Nation. Whether you travel straight through or stop in cities en route, the 3,000-mile coast-to-coast trip on Amtrak is a bargain. Fares start at $223 for the three-night northern route from New York to Los Angeles via Chicago. Galena is the largest city in and the county seat of Jo Daviess County, Illinois, with a population of 3,429 at the 2010 census. A 581-acre section of the city is listed on the National Register of Historic Places as the Galena Historic District. Arecibo is a municipality on the northern coast of Puerto Rico, on the shores of the Atlantic Ocean, located north of Utuado and Ciales; east of Hatillo; and west of Barceloneta and Florida. It is about 50 miles west of San Juan, the capital city. The Manzano Mountains are a small mountain range in the central part of the US State of New Mexico. They are oriented north-south and are about 40 miles long. Central Park is an urban park in middle-upper Manhattan, New York City. Central Park is the most visited urban park in the United States as well as one of the most filmed locations in the world. It opened in 1857 on 778 acres of city-owned land. Cape Elizabeth is a town in Cumberland County, Maine, United States. The town is part of the Portland–South Portland–Biddeford, Maine metropolitan statistical area. Gillette Castle State Park straddles the towns of East Haddam and Lyme, Connecticut in the United States, sitting high above the Connecticut River. Great Smoky Mountains National Park straddles the border of North Carolina and Tennessee. The sprawling landscape encompases lush forests and an abundance of wildflowers that bloom year-round. Lake Winnipesaukee is the largest lake in the U.S. state of New Hampshire, located in the Lakes Region. Asylum Township is a township in Bradford County, Pennsylvania, United States. Vacherie is a small unincorporated community in St. James Parish, Louisiana. Natural Bridge is a town at the southwest edge of Winston County, Alabama, located near the intersection of U.S. Highway 278 and Alabama Highway 13. Alcatraz Island is located in the San Francisco Bay, 1.5 miles offshore from San Francisco, California. Savannah, a coastal Georgia city, is separated from South Carolina by the Savannah River. It’s known for its manicured parks, horse-drawn carriages and ornate antebellum architecture. The Empire State Building is a 102-story skyscraper located in Midtown Manhattan, New York City, on Fifth Avenue between West 33rd and 34th Streets. Discovery Cove is a theme park owned and operated by SeaWorld Parks & Entertainment, located on the outskirts of Orlando, Florida. It is a sister park of SeaWorld Orlando and Aquatica Orlando. Landsford Canal State Park is a South Carolina state park located in Chester County, two miles from US 21. The USA is a land of immigrants and between 1892 and 1954, 12 million newcomers were processed on Ellis Island. Hear their moving stories in the museum; search the database for long-lost relatives. Bryce Canyon National Park, a sprawling reserve in southern Utah, is known for its crimson-colored hoodoos, or spire-shaped rock formations. Since Elvis died in 1977, Graceland has become a shrine for fans. Small by today’s superstar standards, the home of The King has the bling of the 1950s – shagged carpets and a pool room. Universal Studios Hollywood is a film studio and theme park in the unincorporated Universal City community of the San Fernando Valley region of the city of Los Angeles, California. The Wizarding World of Harry Potter is a themed area spanning two theme parks – Islands of Adventure and Universal Studios Florida – at the Universal Orlando Resort in Orlando, Florida. The United States Capitol, often called Capitol Hill, is the seat of the United States Congress, the legislative branch of the U.S. federal government. It sits atop Capitol Hill, at the eastern end of the National Mall in Washington, D.C.
Kilauea is one of the world’s most active volcanoes. From deep within the crater, fumes spout from the lava lake: in daytime, they look like smoke; at night, they glow eerily. Rockefeller Center is a complex of 19 commercial buildings covering 22 acres between 48th and 51st streets in New York City. Because Fairbanks is closer to the highly active Aurora Borealis area over the arctic and the winter nights are longer than they are to the south - the Aurora Borealis light shows are generally much brighter and more reliable over the Fairbanks and the Northern Alaska areas than anywhere else. The National Mall is a national park in downtown Washington, D.C., the capital of the United States. Haleakalā National Park is a national park located on the island of Maui in the U.S. state of Hawaiʻi. The park covers an area of 33,265 acres, of which 19,270 acres is a wilderness area. The National Museum of Natural History is a natural history museum administered by the Smithsonian Institution, located on the National Mall in Washington, D.C.
he Nā Pali Coast State Park is a 6,175 acres Hawaiian state park located in the center of the rugged 16 miles along the northwest side of Kauaʻi, the oldest inhabited Hawaiian island. Epcot is the second of four theme parks built at Walt Disney World in Bay Lake, Florida, near the city of Orlando. It opened as EPCOT Center on October 1, 1982, and spans 300 acres, more than twice the size of the Magic Kingdom park. Holland Island is a marshy, rapidly eroding island in the Chesapeake Bay, in Dorchester County, Maryland, west of Salisbury, USA. The island was once inhabited by watermen and farmers, but has since been abandoned. Cape Perpetua is a large forested headland projecting into the Pacific Ocean on the central Oregon Coast in Lincoln County, Oregon. SeaWorld Orlando is a theme park, and marine-life based zoological park, located on the outskirts of Orlando, Florida. It is owned and operated by SeaWorld Entertainment. Newport is a city in the New England state of Rhode Island, set on Aquidneck Island. Its yacht-filled harbor hosted the America’s Cup, a renowned annual regatta, for many years. Woodland Beach is an unincorporated community in Kent County, Delaware. Woodland Beach is along the Delaware Bay east of Smyrna at the eastern terminus of Delaware Route 6. Cedar Point is a 365-acre amusement park located on a Lake Erie peninsula in Sandusky, Ohio. Opened in 1870, it is the second-oldest operating amusement park in the United States behind Lake Compounce. St. Louis is a city and port in the U.S. state of Missouri. The city developed along the western bank of the Mississippi River, which forms Missouri's border with Illinois. 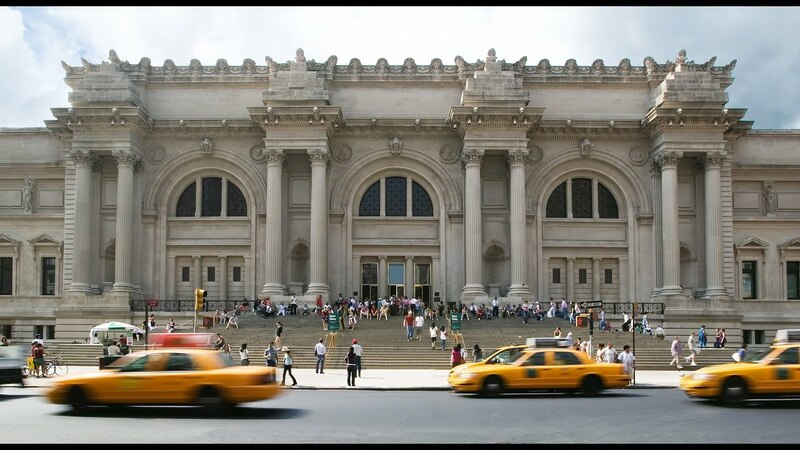 The Metropolitan Museum of Art, colloquially "the Met", located in New York City, is the largest art museum in the United States and among the most visited art museums in the world. The Palouse Falls lies on the Palouse River, about 4 mi upstream of the confluence with the Snake River in southeast Washington. The falls are 198 ft in height. 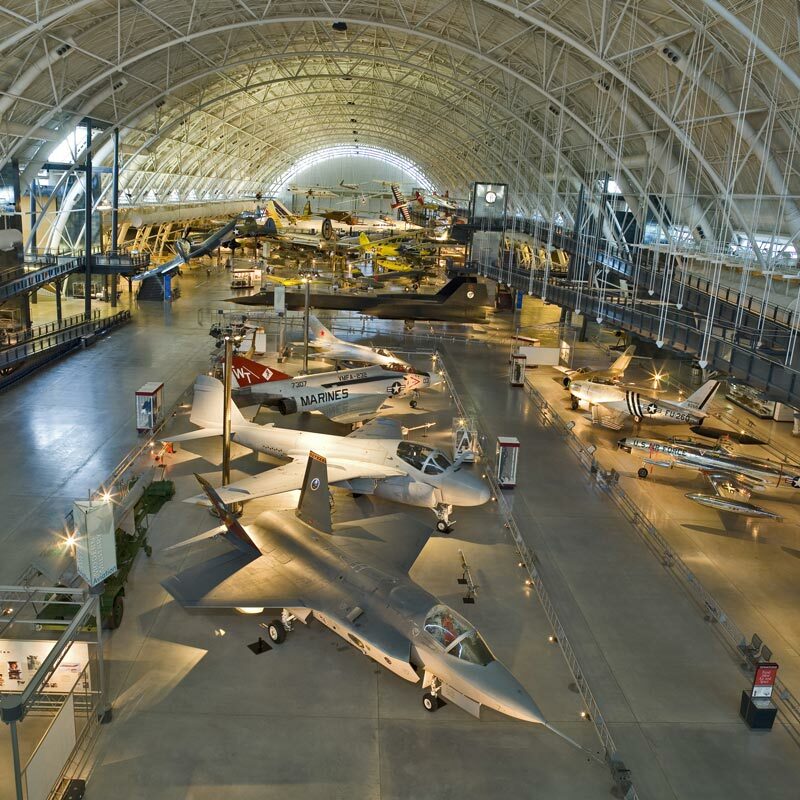 The National Air and Space Museum of the Smithsonian Institution holds the largest collection of historic aircraft and spacecraft in the world in 161,145 square feet of exhibition floor space. Glacier Point is a viewpoint above Yosemite Valley, in California. It is located on the south wall of Yosemite Valley at an elevation of 7,214 feet, 3,200 feet above Curry Village. Sawtooth National Forest is a federally protected area that covers 2,110,408 acres in the U.S. states of Idaho and Utah. The Space Needle is an observation tower in Seattle, Washington, a landmark of the Pacific Northwest, and an icon of Seattle. The Willis Tower, built as and still commonly referred to as Sears Tower, is a 108-story, 1,451-foot skyscraper in Chicago, Illinois. Hoover Dam, once known as Boulder Dam, is a concrete arch-gravity dam in the Black Canyon of the Colorado River, on the border between the U.S. states of Arizona and Nevada. Theodore Roosevelt National Park is a United States National Park comprising three geographically separated areas of badlands in western North Dakota. Gove County is a county located in the U.S. state of Kansas. As of the 2010 census, the county population was 2,695. Its county seat is Gove City, and its most populous city is Quinter. Biltmore Estate is a large private estate and tourist attraction in Asheville, North Carolina. Biltmore House, the main house on the estate, is a Châteauesque-styled mansion built by George Washington . Courthouse and Jail Rocks are two rock formations located near Bridgeport in the Nebraska Panhandle. The Oregon-California Trail, the Mormon Trail, the Pony Express Trail and the Sidney-Deadwood Trail all ran near the rocks. Arches National Park is a US National Park in eastern Utah. The park is located on the Colorado River 4 miles north of Moab, Utah. Mount Rushmore National Memorial is a sculpture carved into the granite face of Mount Rushmore near Keystone, South Dakota. The Kettle Moraine State Forest is a state forest in southeastern Wisconsin. The chief feature of the reserve is the Kettle Moraine, a highly glaciated area. Cataract Falls is a waterfall located in northern Owen County in the west central part of the U.S. state of Indiana. The largest waterfall by volume in the state. The Universal Orlando Resort, commonly known as Universal Orlando, is a theme park resort in Orlando, Florida. It is wholly owned by NBCUniversal and its affiliates. Few events are more gladiatorial than world championship boxing in Vegas. Hersheypark is a family theme park situated in Derry Township, Pennsylvania, about 15 miles east of Harrisburg, and 95 miles west of Philadelphia. Lake Cumberland State Resort Park is a state park located on the northern shore of Lake Cumberland near Jamestown, Kentucky in Russell County. There are 39 theaters in operation on Broadway today, most packed in a small area called the “Great White Way.” Any visit to the city should contain at least one show, whether it’s seeing an edgy new work or a classic piece. The day after Thanksgiving is known as Black Friday, because that is when retailers are said go “into the black”, into profit. This is the kick off to the Christmas shopping season, with sales in malls and outlets. Stores slash prices; shoppers battle for bargains. The Las Vegas Strip is a stretch of Las Vegas Boulevard South in Clark County, Nevada, internationally known for its concentration of resort hotels and casinos along its route. In Baker, California you’ll find the world’s tallest thermometer, which is 134-feet high. In Lamar, Colorado you can stop in at a gas station made from petrified wood. Over in Darwin, Minnesota you might want to see the largest ball of string in the world. It weighs 17,400 pounds and has a diameter of 12 feet. America is still the Melting Pot of the World and there are 254 countries in the world and 198 different nationalities live in the U.S.
Kings Island is a 364-acre amusement park located 24 miles northeast of Cincinnati in Mason, Ohio. Six Flags Magic Mountain is a 262-acre theme park located in Valencia, California, north of Los Angeles. Some of the best wine in the world comes from Northern California’s wine country. 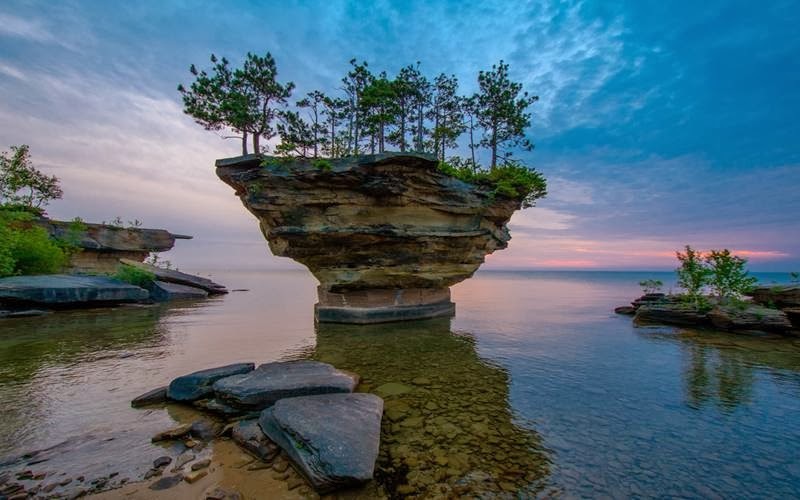 Visitors can tour this beautiful part of the U.S. for reasonable rates. Most wineries are open to the public for educational tours and wine tasting. No other country in the world invests so much in sports as the U.S. Almost every city in the U.S. is a place to watch some of the best college and professional athletes in the world play in some of the most spectacular sports stadiums imaginable. Don’t underestimate the college games. Every country has areas of natural beauty, but in many countries it is difficult to access and enjoy the natural world. Sometimes these beautiful areas become tourist traps or are so remote that only the bravest adventurer would dare enter. But Americans have done a good job of developing inroads to the natural wonders of North America without destroying the environment. The Georgia Aquarium is a public aquarium in Atlanta, Georgia, United States. It houses tens of thousands of animals, representing several hundred species. The Blue Ridge Parkway is a National Parkway and All-American Road in the United States.